For some time now I have been reflecting on what symbols men seem to use in expressing their masculinity. I live in a city with a fairly blue collar history, still surrounded by lots of coal mining, port activity and industry. Without pidgeon-holing and overgeneralising how men express their identities it seems to me that there are three marks of maleness that are often turned to by ordinary young Australian men. Some men seem to manage all three, kind of a like a masculine formula for getting ahead. Now then I'm not into getting judgemental here. I have trained in gyms for nearly 20 years now so I get the attraction and thrill of building muscles and strength. Fast cars and cycles...well from what I can see a lot of money often goes on meticulous maintenance, care and repair... that and everyone certainly knows when a big V8 is around. How could you be missed when your car dominates the sound waves? 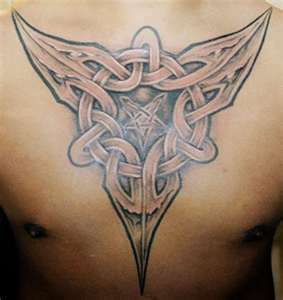 I also have to admit to being absolutely fascinated by tattoos and what they speak to in the soul of both men and women. Around Newcastle every second bloke seems to have a tat. While all of this is understandable and captures a spirit of adventure and risk, to a certain degree, I'm left wondering whether we can all go a bit deeper. Later we may also want to investigate links with anecdotal increased use of steroids and deaths in car accidents and how power, prestige and wealth can also be prioritised by men. In silence we become aware that what we put on show may not be all there is within us. In recognising our compassionate heart we know we are part of the living reality of the suffering world/growing universe and in listening we spend time with voices other than our own....These are qualities found in Christianity and other religious perspectives and in particular in a spiritual life that might be influenced by monastic, quaker and /or a contemplative ethos. These marks of the soul are not something we can arrange or build up but can be seen as already given. The only thing to build up is our awareness of what is already happening...the gifts that have already been given...the 'identity' already given by the Holy One. How might young Australian men be both adventurous and contemplative? Who will encourage them on this journey with all that awareness of deeper layers entails? Augustinian Martin Laird writes engagingly about these alternative realities in Into the Silent Land: A guide to the Christian practice of contemplation (2006). "Precisely because our deepest identity, grounding the personality, is hidden with Christ in God and beyond the grasp of comprehension, the experience of this ground-identity that is one with God will register in our perception, if indeed it does register, as an experience of no particular thing, a great, flowing abyss, a depthless depth. To those who know only the discursive mind this may seem a death-dealing terror or spinning vertigo. But for those whose thinking mind has expanded into heart-mind, it is an encounter brimming over with with the flow of vast, open emptiness that is the ground of all. This 'no thing,' this 'emptiness' is not an absence but a superabundance. It is the fringe of love's cloak (Matt 9:20)."